The first thing to do is make the Sauce Anglais which is used as the base. 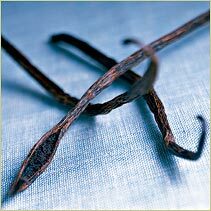 Firstly pour the milk into a thick-bottomed pan and heat to a boil with the vanilla. Meanwhile separate the yolks from the eggs but keep the albumen, which will be used to make meringue at the end. 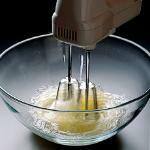 Whisk the yolks in a large bowl with the caster sugar until fully combined. Just before the milk comes to a boil pour a little into the eggs and sugar and mix thoroughly, then repeat once more. Pour all of the mixture back into the milk and immediately turn the heat down to minimum as not to scramble the eggs. Continuously stir to cook the sauce for five to six minutes. Now pour into a fresh bowl and lay cling film onto the surface of the sauce to stop a skin forming. Chill in the fridge until needed. 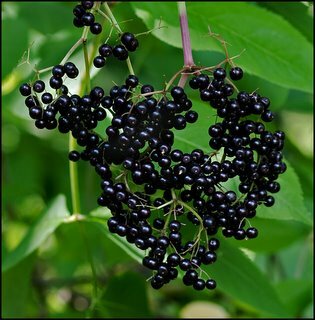 To make the elderberry sauce, first make sure the berries are thoroughly washed before use, especially if you have picked them yourself. Melt the butter in a large skillet and add the elderberries. Add some water to create a little steam and allow to stew down for a minute. Now add the brown sugar and continue to stew the berries until the juice has been extracted. The berries have tiny seeds similar to that of grapes and so you can't really eat them whole, even if blitzed. Take the berries in their juice and pour into a sieve above a bowl. Press with a mortar (from a pestle and mortar) until the juice is extracted. Now place the berries into a blender and blitz to get the last of the juices out. Finally put back into the sieve and press again. What you will be left with is a thick and very concentrated juice, which you should cover and refrigerate immediately. When both the elderberry sauce and the ice cream are cool, add the sauce to the ice cream base slowly, stopping to taste until you have the desired flavour and consistency. Keep a little of the sauce for the meringue later. Now add to your ice cream maker and churn as the instructions dictate. When you have the correct consistency add to round moulds to make individual portions or pour into one large mould or dish to make one big baked Alaska. Now for the meringue. Whisk the egg whites with the caster sugar and enough of the elderberry sauce to turn it light blue (not much at all), until firm peeks form. Then spread the meringue over each ice cream portion in the moulds or, if you're making one big alaska, spread it out over the ice cream in the mould or dish. Freeze to set the meringue and ice cream together. When fully frozen and firm, use a blowtorch to cook the meringue on the surface or bake at 200°C very quickly until lightly browned. Turn out the baked alaskas from the moulds or, if you've made one large dish, cut portions out to serve. Enjoy!